"The Science Museum" redirects here. For other museums of this name, see Science Museum (disambiguation). For the type of museum, see Science museum. A museum was founded in 1857 under Bennet Woodcroft from the collection of the Royal Society of Arts and surplus items from the Great Exhibition as part of the South Kensington Museum, together with what is now the Victoria and Albert Museum. It included a collection of machinery which became the Museum of Patents in 1858, and the Patent Office Museum in 1863. This collection contained many of the most famous exhibits of what is now the Science Museum. In 1883, the contents of the Patent Office Museum were transferred to the South Kensington Museum. In 1885, the Science Collections were renamed the Science Museum and in 1893 a separate director was appointed. The Art Collections were renamed the Art Museum, which eventually became the Victoria and Albert Museum. When Queen Victoria laid the foundation stone for the new building for the Art Museum, she stipulated that the museum be renamed after herself and her late husband. This was initially applied to the whole museum, but when that new building finally opened ten years later, the title was confined to the Art Collections and the Science Collections had to be divorced from it. On 26 June 1909 the Science Museum, as an independent entity, came into existence. The Science Museum's present quarters, designed by Sir Richard Allison, were opened to the public in stages over the period 1919–28. This building was known as the East Block, construction of which began in 1913 and temporarily halted by World War I. As the name suggests it was intended to be the first building of a much larger project, which was never realized. However, the Museum buildings were expanded over the following years; a pioneering Children's Gallery with interactive exhibits opened in 1931, the Centre Block was completed in 1961-3, the infill of the East Block and the construction of the Lower & Upper Wellcome Galleries in 1980, and the construction of the Wellcome Wing in 2000 result in the Museum now extending to Queen's Gate. The Science Museum now holds a collection of over 300,000 items, including such famous items as Stephenson's Rocket, Puffing Billy (the oldest surviving steam locomotive), the first jet engine, a reconstruction of Francis Crick and James Watson's model of DNA, some of the earliest remaining steam engines (Including an example of a Newcomen steam engine, the world’s first steam engine), a working example of Charles Babbage's Difference engine, the first prototype of the 10,000-year Clock of the Long Now, and documentation of the first typewriter. It also contains hundreds of interactive exhibits. A recent addition is the IMAX 3D Cinema showing science and nature documentaries, most of them in 3-D, and the Wellcome Wing which focuses on digital technology. Entrance has been free since 1 December 2001. The Science Museum has a dedicated library, and until the 1960s was Britain's National Library for Science, Medicine and Technology. It holds runs of periodicals, early books and manuscripts, and is used by scholars worldwide. It was, for a number of years, run in conjunction with the Library of Imperial College, but in 2007 the Library was divided over two sites. Histories of science and biographies of scientists were kept at the Imperial College Library in London until February 2014 when the arrangement was terminated, the shelves were cleared and the books and journals shipped out, joining the rest of the collection, which includes original scientific works and archives, in Wroughton, Wiltshire. The Imperial College library catalogue search system now informs searchers that volumes formerly held there are "Available at Science Museum Library Swindon Currently unavailable". A new Research Centre with library facilities is promised for late 2015 but is unlikely to have book stacks nearby. In November 2003, the Science Museum opened the Dana Centre. The centre is an urban bar and café annexed to the museum. It was designed by MJP Architects. In October 2007, the Science Museum cancelled a talk by the co-discoverer of the structure of DNA, James D. Watson, because he claimed that IQ test results showed blacks to have lower intelligence than whites. The decision was criticised by some scientists, including Richard Dawkins, as well as supported by other scientists, including Steven Rose. On the evening of the last Wednesday of every month (except December) the museum organises an adults only evening with up to 30 events, from lectures to silent discos. Previous Lates have seen conversations with the actress activist Lily Cole and Biorevolutions with the Francis Crick Institute which attracted around 7000 people, mostly under the age of 35. Video of a Corliss steam engine in the Power Gallery in motion. The East Hall is the first area that most visitors see as they enter the building, stretching up through three floors. On the ground, the area is mostly filled with iconic steam engines of various sorts, including the oldest surviving James Watt beam engine, which together tell the story of the British industrial revolution. Up in the air, suspended from the ceiling is a giant metallic ring, the inside of which is covered in white LEDs which form patterns and display messages typed into kiosks by visitors in the Energy gallery. Also on display is a recreation of James Watt's garret workshop from his home, Heathfield Hall, using over 8,300 objects removed from the room, which was sealed after his 1819 death, when the hall was demolished in 1927. 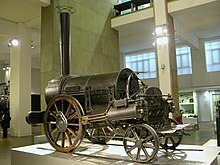 Making the Modern World is a relatively new gallery, in which some of the museum's most iconic objects, including Stephenson's Rocket, Watson and Crick's double helix, and an Apollo spacecraft, are imaginatively displayed along a timeline chronicling man's technological achievements. Flight is another longstanding gallery, up towards the western end of the third floor. Contained in the gallery are several full sized aeroplanes and helicopters, including Alcock and Brown's transatlantic Vickers Vimy (1919), Spitfire and Hurricane fighters, as well as numerous aero-engines and a cross-section of a [Boeing 747]. One of the most popular galleries in the museum is the interactive Launchpad gallery. Redesigned and reopened in November 2007, the new look gallery houses over 50 interactive exhibits illustrating many different concepts in physical science. The gallery is staffed by Explainers who are available to demonstrate how exhibits work, conduct live experiments and perform shows to schools and the visiting public. Launchpad has now closed, the Science Museum are preparing a new Interactive gallery which opens in late 2016. The new gallery will be bigger than Launchpad and packed with state-of-the-art interactive exhibits. This gallery is a collaboration between the Science Museum and the National Science and Media Museum in Bradford, home of a photography collection of more than three million images. It was opened on 24 October 2014 by the Queen, Elizabeth II, who sent her first tweet. It replaced the former Shipping galleries, on the second floor, which closed on 15 May 2012. Their contents were 3D scanned and made available online. A gallery which opened in December 2014 that aims to inspire school children to go into careers in engineering, developed with a consortium of companies and the Royal Academy of Engineering. These range from the award-winning Codebreaker, on the life of Alan Turing, to Unlocking Lovelock, which explores the archive of James Lovelock. ^ "Big Ambitions Serious science : Annual Review 2013–14" (PDF). Sciencemuseum.org.uk. Retrieved 2015-03-10. ^ "Science Museum | British History Online". British-history.ac.uk. Retrieved 2015-03-10. ^ a b c "Museum history". About us. London: Science Museum. Retrieved 2016-06-24. ^ Encyclopædia Britannica. "Science Museum (museum, London, United Kingdom) – Britannica Online Encyclopedia". Britannica.com. Retrieved 2010-07-07. ^ "Library and Archives – About us". Science Museum. 3 February 2010. Retrieved 10 June 2015. ^ "Blythe House – About us – Science Museum London". Retrieved 21 September 2011. ^ "Dana Centre, Wellcome Wolfson Building". Mjparchitects.co.uk. Archived from the original on 28 June 2009. Retrieved 27 August 2009. ^ McKie, Robin; Harris, Paul (21 October 2007). "Disgrace: How a giant of science was brought low". The Guardian. London. Retrieved 29 September 2010. ^ Rose, Steven (21 October 2007). "Watson's bad science". The Guardian. London. Retrieved 23 May 2010. ^ "Hawking joins British astronauts in hailing record figures for educational visits to Science Museum – About us". Science Museum. 21 February 2012. Retrieved 10 March 2015. ^ "Impossible trees grow in the Science Museums". Retrieved 10 March 2015. ^ "Record-breaking attendance at Crick event | The Francis Crick Institute". Crick.ac.uk. 27 February 2014. Retrieved 10 March 2015. ^ "Watt's workshop". Science Museum, London. Retrieved 26 June 2015. ^ "Media Space". Sciencemuseum.org.uk. Retrieved 10 March 2015. ^ "Her Majesty The Queen sends her first tweet to unveil the Information Age | Inside the Science Museum". Blog.sciencemuseum.org.uk. 24 October 2014. Retrieved 10 March 2015. ^ "Engineer Your Future". Sciencemuseum.org.uk. 17 December 2014. Retrieved 10 March 2015. ^ "Codebreaker wins Great Exhibition award | Inside the Science Museum". Blog.sciencemuseum.org.uk. 17 December 2012. Retrieved 10 March 2015. ^ "Unlocking Lovelock: Scientist, Inventor, Maverick". Sciencemuseum.org.uk. Retrieved 10 March 2015. ^ "Science Museum Live: The Energy Show". Sciencemuseum.org.uk. Retrieved 10 March 2015. ^ "Science Museum's Launchball game adds prestigious 'Best of the Web' title to awards haul – About us". Science Museum. 23 April 2008. Retrieved 10 March 2015. ^ "10:10 stories". Maps.google.co.uk. 25 January 2011. Retrieved 10 March 2015. ^ "Image of jon tucker, head of science museum, 2002. by Science & Society Picture Library". Scienceandsociety.co.uk. 23 April 2008. Retrieved 10 March 2015. 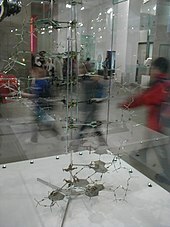 Wikimedia Commons has media related to Science Museum, London. This page was last edited on 8 April 2019, at 08:36 (UTC).